Skin is considered to be a mirror showing the health status of a human body. It is the organ covering the surface of a human body. Skin which looks healthy and young is attractive to others as well as satisfying to oneself. Proper skin care habits are very important. Skin is largely classified into three parts; epidermis, dermis and subcutaneous fat from the outer layer. Epidermis is comprised mostly with keratinocyte. Dermis is mainly comprised of collagen and elastin, which impact the skin’s resilience. It includes appendages of skin such as nervous tissues, hair follicles, eccrine and apocrine sweat gland unit. Furthermore, the subcutaneous fat under the dermis comprises fat cells with the close relationship with dermis in structural and functional aspects through nerves and blood vessels. functional and smarter than skin. pressure, pain, cold and heat sense. However, skin which performs so many functions unfortunately faces aging as skin metabolism is gradually degraded by a number of changes as time goes by. 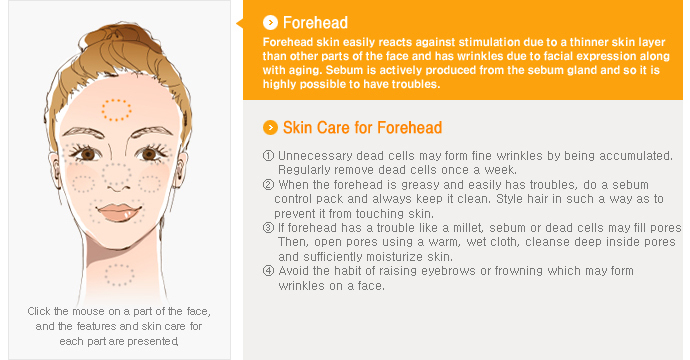 Accordingly, regular skin care is the best way to keep beauty and prevent aging. Skin types vary by person. What is important for skin care is that skin can be kept healthy and beautiful only by skin care suitable for each skin type. 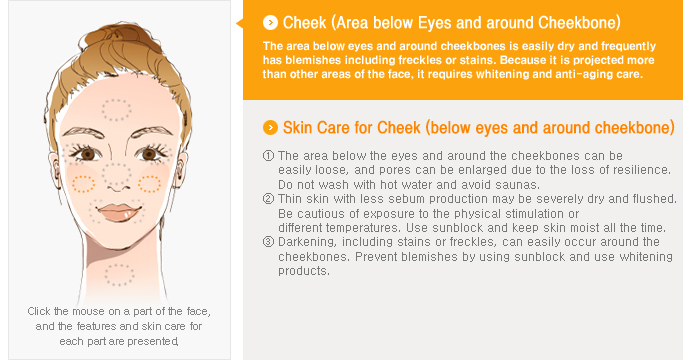 Accordingly, it is important to accurately identify the skin type and apply proper skin care for each skin type. 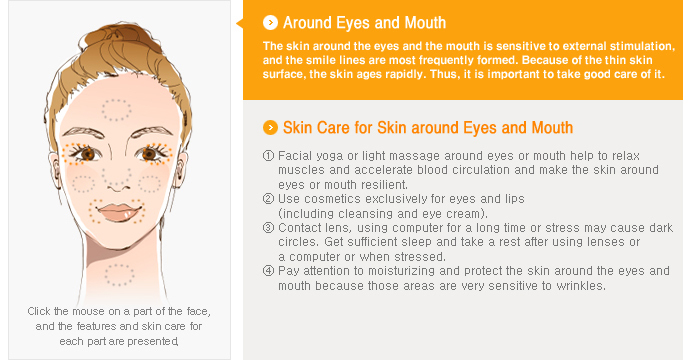 Facial skin is more sensitive than on any other part of the body and is always exposed to the external environment. Furthermore, each part of the face has diverse features so that some parts of the face quickly age. There may be aging unbalance on a face. For a healthy and balanced face, it is necessary to customize skin care for each part of the face, starting now!